I meant to write about this back in September but I forgot and the email got buried in my inbox. But I think this is really cool so I’m posting it now because I think most people still haven’t heard of it. In short, eBay Green Team has partnered with a company, Patagonia, specifically with the aim of having eBay sellers, especially Trading Assistants, resell their items. When so many companies are issuing take-downs and fighting the second hand market, I thought this was incredibly forward thinking and really hope this is just the first of many such partnerships. As you may already know, eBay and Patagonia have joined forces to help people get the most out of their favorite clothing and gear and to help keep in circulation what they no longer need or use. The Patagonia + eBay Common Threads Initiative is the result of a year of collective thinking and planning, between eBay, Patagonia and our customers. It’s pretty uncommon for a major brand name retailer to encourage people to resell their products, but to partner with eBay to better enable customers to do just that is truly innovative! This collaboration can open up new, ground-breaking opportunities for Trading Assistants to encourage participation and possibly partner with retailers in their own neighborhood. That’s why we are letting you know about this great incentive ahead of the general eBay membership. We are very happy to inform our active Trading Assistants that we are offering the first 500 of our community members $20 to take the pledge and list a pre-owned Patagonia item in the store. As a Trading Assistant, you are hearing about this incentive before most other eBay members, and therefore, get a head start on everyone else. Go take the Common Threads Initiative pledge. 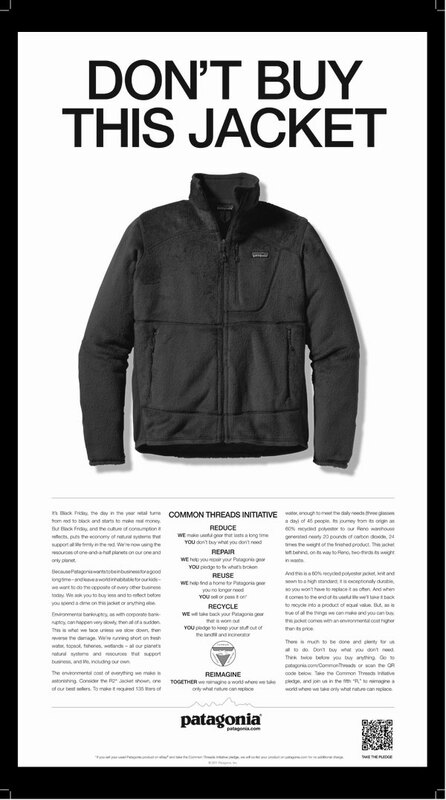 List a pre-owned Patagonia item (see FAQ for instructions). Your item will appear in both the eBay store and – for the first time ever – on the Patagonia site, Patagonia.com. Watch for a $20 eBay Gift Certificate to be deposited into your PayPal account. How is easy that? Now go take the pledge, list your item and make some green for being (even more) green. * Limit of 1 US $20 eBay Gift Certificate per person. 500 ($20) eBay Gift Certificates will be awarded to the first 500 non-employee sellers to take the Common Threads pledge (the “Pledge”) and list used Patagonia items in the Common Threads store on the eBay site (“Listing”). Use of eBay Gift Certificates is subject to terms and conditions at http://pages.ebay.com/help/pay/certificates.html. The eBay Gift Certificate shall be deposited in your PayPal account within 10 days of your Pledge and Listing. To redeem an eBay Gift Certificate, you need to log into your PayPal account when purchasing an item on eBay. No cash back will be available. eBay reserves the right to hold back, reverse or otherwise suspend any eBay Gift Certificate in its sole discretion to investigate compliance with eBay’s policies. PreviousIs the only acceptable time to leave an eBay seller a low DSR for shipping cost… never? NextDon’t wait until it’s too late. Live your life and start working towards your goals now.